The scandal now engulfing Justin Trudeau and his Liberal Party is the kind of train wreck that confirms the public’s worst feelings about politicians and their back-room dealings. The fact that the Mr Nice Guy of global politics is at the centre of it is, as the Guardian recently put it, like watching a unicorn get run over. Oh, it also happens to be election year in Canada. The former Attorney General, Jody Wilson-Raybould alleged she was pressured over a period of four months to come up with a “deferred prosecution agreement” (i.e. a plea bargain) whereby SNC-Lavalin was shamed and fined in an out-of-court settlement, but evaded a criminal trial. In the key Quebec seats, the likelihood of severe local job losses resulting from a successful federal criminal prosecution would have seen the Liberals hammered during the upcoming election. However, Wilson-Raybould refused to play along and was eventually demoted. Crucially, she has also recently testified in detail about being pressured by a series of senior politicians and officials seeking her compliance. A former public prosecutor and a regional chief within the tribal assembly of First Nations in British Columbia, Wilson-Raybould had been the most prominent First Nations appointee in the Trudeau administration. No doubt, SNC-Lavalin had good reason to exaggerate to Trudeau – whose parliamentary seat is located in Quebec – the likely size of the fallout from any criminal conviction. Even so, there’s no doubt that a ten year freeze on bidding for federal contracts would have resulted in major job losses. So far, only Trudeau’s chief adviser Gerald Butts has resigned over the scandal, and he will reportedly be testifying before a parliamentary committee next week, in what will be the first occasion on which Trudeau’s side of the scandal will have been aired. There is a talk of a criminal probe into the scandal. To date, Trudeau – who denies any wrong-doing – has simply batted away the media’s questions about whether he feels he should resign. Informal polling indicates that Trudeau personally, and the Liberal Party alike are suffering damage from a scandal likely to run for months, and dominate the election campaign. At best, the Liberals may well try to argue that no personal enrichment was involved, and that any intervention was done purely to ensure that Canadian/Quebecois workers did not have to bear the brunt of the wrong-doing by SNC-Lavalin. One problem with any such argument about principled intervention though is that Trudeau is – at exactly the same time – claiming that his government cannot intervene in the extradition proceedings involving the Huawei executive, Meng Wanzhou. With justification, China can now point out that the Trudeau administration seems more than willing to intervene in judicial proceedings when it feels sufficiently motivated to do so. If China needed any further incentive to come down hard on Canada, the SNC-Lavalin scandal has just given it fresh ammunition to feel aggrieved. If nothing else, the Trudeau scandal should be a warning to any government that becomes too reliant on the charisma of its star performer. That star power had vaulted the Liberals from third place at the start of the 2015 election, to ultimate victory. This was largely on the basis of Trudeau’s outstanding performances in the televised political debates. The 2015 election had seen the Liberals increase their parliamentary share from 36 seats to a stunning 184 seats. That electoral tide is now going out, with a vengeance. New Zealand has good reason to feel concerned. Despite Trudeau’s personal failings (his unfounded self-regard seems to be of David Cunliffe proportions) his administration has been a useful ally for New Zealand, especially in a world where China and the US are now locked in a damaging trade war. Canada and New Zealand have been lonely voices raised in support of multilateralism, and a rules-based international order. Canada’s instinct is to redouble its commitment to old principles rather than to adopt new ones. It remains a vocal defender of human rights, which pleases idealists but annoys despots… Canada’s Liberal government is therefore sticking with the foreign policy it adopted when it took office in 2015. [This] has three main elements: to work with like-minded countries to shore up multilateral institutions; to invest more in the armed forces; and to diversify trade. The question is how well this will work in a jungle-like world… Foreign-policy boffins once fantasised about setting a truly independent course for Canada, but that now seems unrealistic. 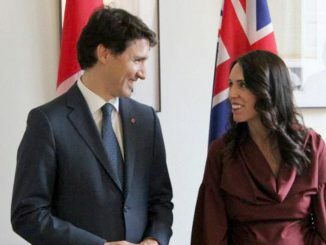 If Trudeau goes, New Zealand will have a lost a major like-minded ally for our ongoing attempts to shore up the rules-based international order on which we depend for trade, and for security. More than ever, multilateralism is looking like an endangered species.